When Jersey and Guernsey line-up for the 100th Muratti Vase final on Saturday, one man will be watching with a tinge of sadness, knowing his special association with the the big game is coming to an end. After a quarter of a century providing expert analysis on the Channel Islands' grudge match, BBC Radio Jersey's Richard Collinson is stepping away from the microphone. The Hull-born former schoolteacher has brought his knowledge of the local game and his time as semi-professional player in England to listeners around the island, and latterly thanks to the internet, around the world. As a youngster growing up in Jersey, I can remember listening to Richard and Roger Bara, his long-time partner in the commentary box, when the game was held over the water. 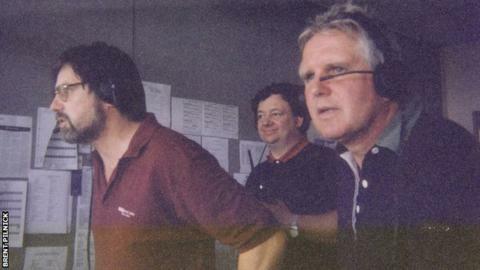 Years later I would be lucky enough to share that commentary box with him before I moved on to pastures new. "It's always a special day, and that feeling is in the air whether you're in Guernsey or Jersey," he said. Collinson had been around the game in Jersey for many years before he took up broadcasting, managing the island's junior side as well as leading First Tower United into the FA Vase. He also had spells as manager of Old Victorians and St Ouen. Having been on the books of Hull City as a youngster, Collinson played semi-professionally in the north of England, most notably for Goole Town, as well as a number of clubs in Leicestershire. But after training to be a teacher he left Yorkshire - although his accent remained - and moved to Jersey to teach at Victoria College's preparatory school in 1977, a role he held until he retired in 2003. "I've seen pretty much every Muratti since I came over to the island, as I had players who had been with me at different clubs who were involved," he remembers. "Probably my best memory of a Muratti is one when I wasn't commentating. It was in 1984 when Jersey won 6-2 with four goals in extra time. "Peter Fleury turned the game on its head by coming on in extra time as a substitute and scoring a hat-trick." One incident when he was behind the microphone does stick in his mind, an infamous moment in 1992 when Guernsey's top striker Kevin Le Tissier - the brother of Southampton legend and England forward Matt - had his own 'Hand of God' moment as Guernsey beat Jersey 3-2 at Springfield. "At the time I thought 'that's a Maradona'," said Collinson. "But as it was my early commentary days I resisted saying it at the time and I've always regretted that. "It was exactly how I saw it, it was a handball, we saw that on television later, and I wished I'd have said it in commentary, and I would do now." So what of the future of the match? Guernsey's top footballers now play in England for Guernsey FC, both island's rugby sides play week-in, week-out in the English leagues, with Jersey's team being fully professional in the Championship, while the two cricket sides take part in international competition. "I believe the Muratti is still up there as possibly the main sporting event in the Channel Island calendar. "But the sport in Jersey's stagnated in relation to football being played in Guernsey and other sports such as cricket and rugby," he said. "Unless Jersey get a realistic match programme in place as an island team they won't be able to compete against Guernsey, and they won't be able to do what they've done in rugby and restrict it, as all the Guernsey players are Guernsey-based. "The only way Jersey can realistically compete in future years will be to get a team playing outside of the island." While plans are afoot to try and join Uefa, like Gibraltar have done, Jersey will have to make do with a small number of friendlies. Maybe one day Jersey will host the likes of Italy, England and France at Springfield in Euro qualifiers, but the Muratti will still be special, even if a certain Yorkshire voice is no longer describing it.